According to what I have read, the title of this blog was an idea that Luigi Veronelli had for his native city of Bergamo. Today, November 29 is the sixth anniversary of Veronelli’s death. Both Franco Ziliani and Jeremy Parzen at Dobianchi wrote beautiful tributes to Veronelli on their respective blogs. I decided to write instead about the beautiful city of Bergamo which Veronelli wanted to promote at the Capitale della Gastronomia Italiana. I have numerous friends who live in Bergamo, some who cheer for Atalante – the local team others who are diehard Inter fans but all of whom love their city. I have spent a fair bit of time in Bergamo and I am always happy to go back for a meal, an exhibition of just a hike up and down the hills and beautiful streets. My first dinner outside of Milan when I moved North in 1995 from Florence and Bologna was in Bergamo at a restaurant called Trattoria da Ornella. 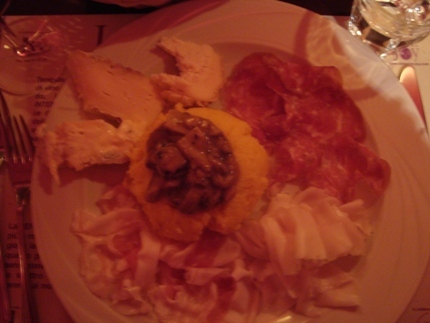 It was the first time I had Polenta Taragna , a typical dish from the Valtellina, another area of Lombardy. It was very picturesque with high ceilings and I ate more meat than I had ever seen in an Italian restaurant. 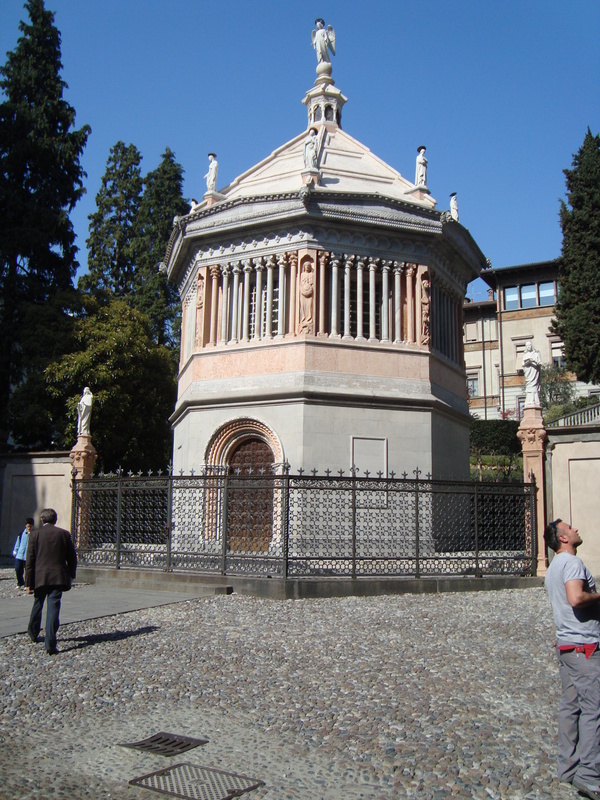 That was my first experience in the lovely city of Bergamo. 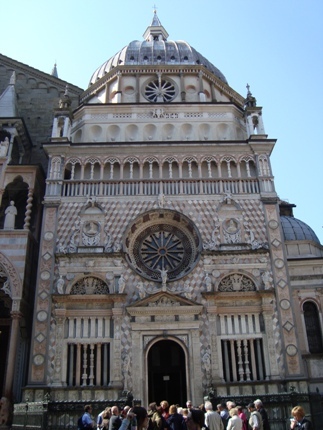 On my second visit, I got a proper tour of that beautiful city with its gorgeous main Piazza del Duomo where the Catherdal di S. Alessandro in Bergamo is located. I just love this complex of buildings and the way they work together to form a harmonious unit despite the differences in style and age of the monuments and churches. In addition to my love of wine, food and all things Italian, there is almost nothing in the world that makes my heart sing as much as the architectural and artistic delights that abound throughout Italy. In fact, my initial move to Italy was to become a gold leaf restorer but that is a story for another day. 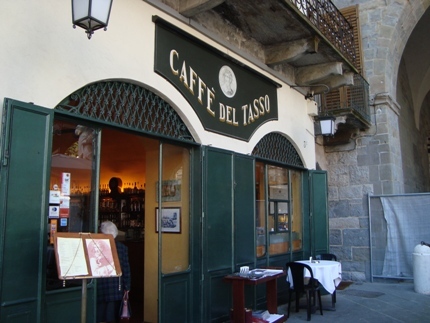 We walked around Bergamo Alta for a long time before stopping for a caffe at Caffe del Tasso in the main piazza. Our biggest decision was where to go for dinner and what wines to try. Lombardy is becoming an ever more important wine region in the United States but Valcalepio, the area near the city of Bergamo is still quite unknown in the US but also in many parts of Italy. The Consorzio Tutela Valcalepio was founded in 1976 by 22 members. Today, the consortium has 85 members, or about 98% of the producers of Valcalepio. 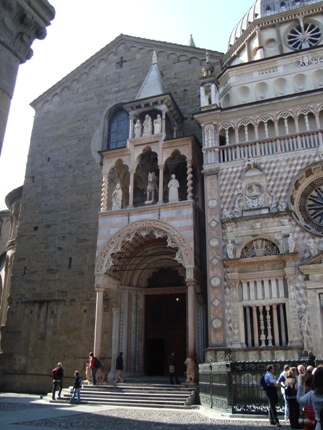 The area is in the province of Bergamo and has two main wines that are allowed to have the DOC denomination. The Valcalepio Rosso DOC made from Cabernet Sauvignon (25%-60%) and Merlot. The grapes are harvested and fermented separately. The wine is then blended and aged. If aged for three years, at least one in wood, it can be called a Riserva. Of the 400 hectares that go into making wines in the Valcalepio area, 70% are used for the Valcalepio Rosso. The Valcalepio Bianco DOC is made from Pinot Bianco and Chardonnay (55% to 80%) and Pinot Grigio (20% to 45%). Additionally, there is a lovely dessert wine, the Valcalpeio DOC Moscato Passito. This wine made from the Moscato di Scanzo will get its’ own entry tomorrow. Suffice it to say it is a red grape and is very exciting. In addition to the DOC wines, a line of IGT wines are also made including a traditional method sparkling wine. 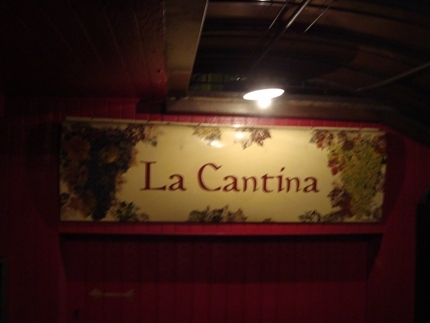 My friends and I went to a local restaurant to try some of these wines, La Cantina . In addition to delicious polenta, I had a selection of cheese and charcuterie that paired perfectly with the Valcalepio Rosso. The area is famous for its Taleggio, salami Bergamasco, lardo and pancetta. No post on Bergamo and the Valcalepio can be complete without mentioning the Cantina Sociale Bergamasca. 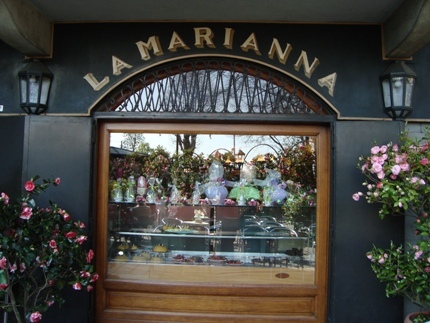 This cooperative was founded in 1957 in San Paolo d’Argon. It has 150 members and 160 hectares of vines. The DOC was made possible through the collaboration of the Cantina Sociale Bergamasca and the Consorzio mentioned earlier. The coop produces some 800,000 bottles annually and exports currently 10% of its production. I tried the Akros, a Valcalepio Rossi Riserva DOC which was very French in nature and round, according to my notes. I also tried the Linea Orologio Valcalepio Bianco which had nice acidity with some lees aging before bottling. I wish I had a glass of these wines to toast Veronelli but I toasted him with another Lombard wine made with bollicine or bubbles. I’m sure many raised a glass to him tonight. Bergamo sounds like your perfect place, It’s pretty easy planning a visit too, as RyanAir flies there from many destinations. I love this place.